Bank fraud is a non-violent, white-collar crime. It happens when someone illegally obtains money, assets, or other property from a financial institution; or when someone obtains money from a financial institution’s depositors by fraudulently posing as a representative of that institution. The term is applied when a deception or pretense is employed rather than an outright bank robbery or theft. If you’re accused of bank fraud, it’s imperative to get legal help immediately from a skilled Portland bank fraud attorney: Portland bank fraud attorney David T. McDonald. The federal Bank Fraud Statute of 1984 specifies what actions can be prosecuted as bank fraud: check kiting and forging, unauthorized use of automated teller machines (ATMs), non-disclosure on loan applications, credit card fraud, and diversion of funds. Other laws address money laundering, bribery, and passing bad checks, behaviors that may also be considered bank fraud. Because banks are federally insured, bank fraud is a federal offense. It’s also serious business. Anyone convicted of bank fraud faces potentially 30 years in a federal prison and a one million dollar fine. That’s not all. The financial institution can take you to civil court to recover its losses. You’re going to need experienced help from a Portland bank fraud attorney who understands the federal court system. Portland bank fraud attorney David T. McDonald is the attorney to call. Portland bank fraud attorney David McDonald will develop the defense strategy that most effectively protects your freedom. Perhaps a simple misunderstanding or an innocent mistake led to a bank fraud accusation against you. Possibly your rights have been violated and the charge should be dropped. With his legal skills and considerable experience, David McDonald can bring your case to its best possible resolution. If you’re charged with bank fraud – or just being investigated – waste no time. Call Portland bank fraud attorney David McDonald promptly. In Oregon, David McDonald represents clients in Portland and in Washington, Clackamas, and Multnomah counties. In Washington, he represents clients in Clark County and throughout the state’s southwest. He also works with Spanish-speaking investigators and interpreters to assist those in the Hispanic community. 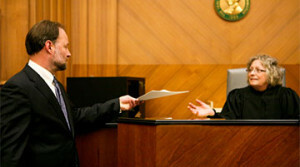 To schedule an initial consultation, call the law firm of David T. McDonald at 503-226-0188. Evening and weekend appointments are available.